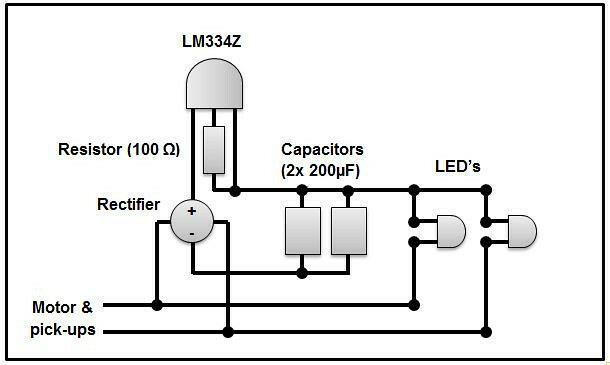 Over on the NGRM forum Harry Manthekis had posted a circuit he uses for LED lights, which uses a tiny chip to regulate the current and small capacitors to remove any flicker. 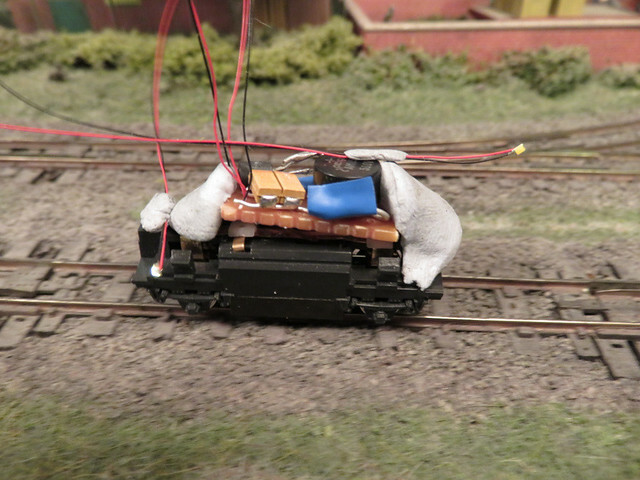 My simple circuit certainly suffered from flickering, and varying brightness as the controller speed was increased, so I figured it worth trying Harry's idea. The LM334Z gives out a regulated current ensuring that once the operating voltage is reached the LED's run at constant brightness, the resistor "sets" that current and I found 100 ohm suited me, not too bright. The capacitors ensure no flicker (especially useful with a feedback or PWM controller). Harry's circuit connected the cathode (-) of the LED to the - side of the rectifier and capacitors, however I wanted two directional LED's and realised that grounding them to each of the motor/pick-up connections would mean only one would light, depending on polarity. I've not shown the suppression capacitor accross the motor as it's part of the chassis, but I'm told it should be present to protect the LM334Z chip - especially from high frequency track cleaners. 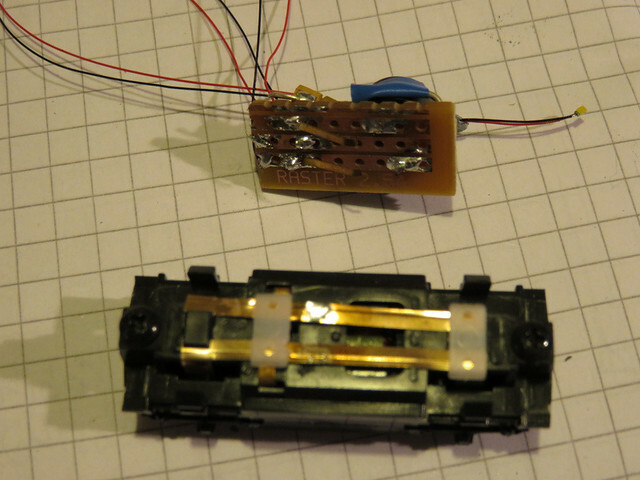 It took a while to figure out how to assemble the parts in a compact space, I'm sure there must be smaller rectifiers! 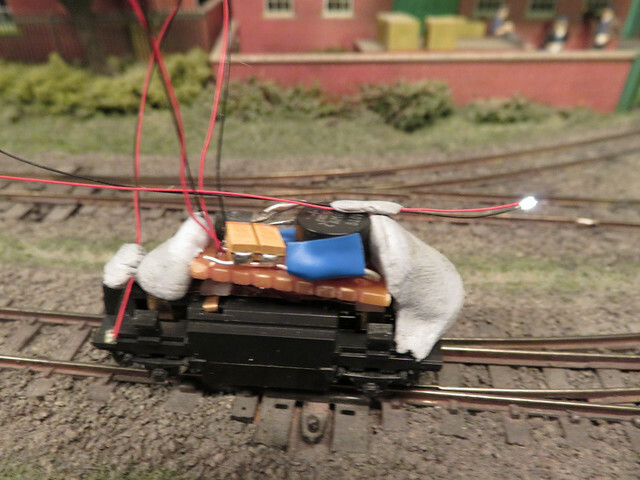 I will trim the LED leads once installed in the loco, but here's a trial run. Note one LED lit (on the left). And with direction reversed, here's the other one lit. They do light much more steadily, so the extra circuit complexity is worth it. 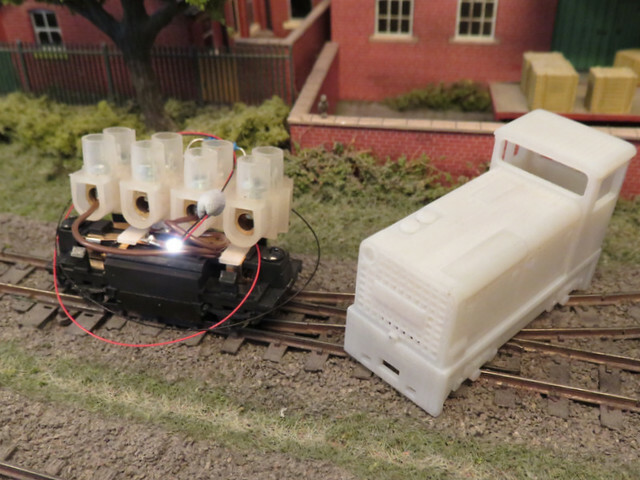 With the circuit removed the means of contact can be seen, it will be mounted inside the body of the loco and the two springy contacts touch the pick-up strips on top of the Kato chassis. I'd removed the capacitor while fitting the electronics, it's since been replaced out of the way of the contacts, and the circuitry protected with much more insulating tape.